I’ve just come back from a long trip to Japan and getting over the inevitable post-travel flu. Bleh. But while I was there I still needed to keep up with my homework AND one of my critique partners sent me her notes on my manuscript. So I was chipping away at that. 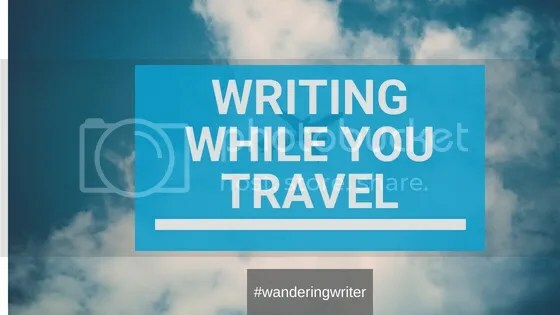 So a post about writing while traveling seems appropriate. As writers, we often use every excuse possible for why we didn’t get our word counts in. I have to work out. I work a full-time job. I’m on vacation. Believe me, these are the thoughts that consume me ALL THE TIME. Especially when the full-time job sends me on trips. For some writers, traveling is a dreaded word, because you just know you’re not going to get any work done. At the same time a good number of authors I follow travel all the time and still manage to write a book every year. Time management is important but also you need to figure out how to make traveling work for you. Use Down Time wisely. The thing people often forget about is traveling has a lot of down time. I’m always waiting for some form of transportation. That is the perfect writing time. Don’t complain about the waiting, use that time to get some words knocked out. Your travel schedule may be busy busy busy, running from one place to another and seeing the sights, but one thing is for certain you will be spending time in a car or on a plane. That is your time to get some writing in. Pubs and Cafes are Your Best Friend. When your not on a plane or in a car, sometimes you just need to go to a local Café (with your computer) and grab a bite. I love doing this in new places. It makes me feel good since I’m getting out AND getting writing done. No internet no problem. The good thing about traveling is you don’t have the crutch of the internet to keep you from working. Take the time to just get some word sprints in! Traveling is really a blessing in disguise. Don’t be ruled by your word count. Remember, you don’t need to reach your word count. Let the new sights and the city inspire you. It doesn’t need to be all work and no play. Allow yourself to get half of your usual word count. If you get even a little writing done that is progress. Remember that! Make sure you have a book. If you find you just can’t write while traveling then at least make sure you bring a book. Keep those creative juices flowing, plus flying or driving are perfect reading times since there is little to distract you from a good book. As writers it is just as important that we keep reading so we know our genre and can make note of what works and what doesn’t. Traveling is always so nice. I always finish a book on the long plane rides and layovers. That is all for today! Anyone had some great travel stories to share? Any additional tips? I’m going to start the tag #wanderingwriter to show the unique places I’ll be writing. Feel free to add to the tag and contribute your own pictures!